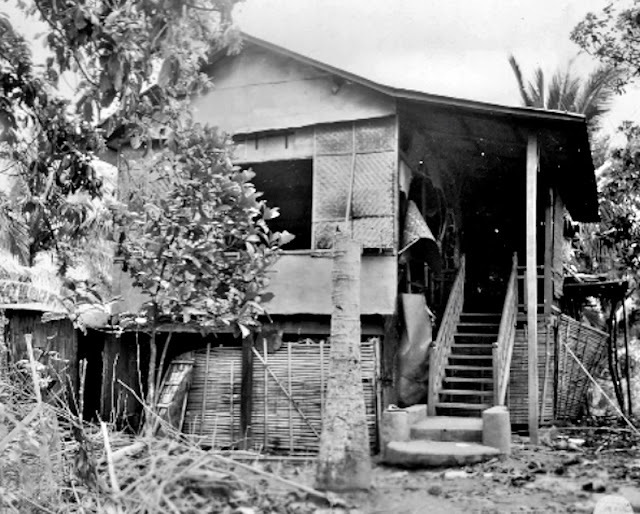 Original caption: Photograph of the house where the victims were taken. 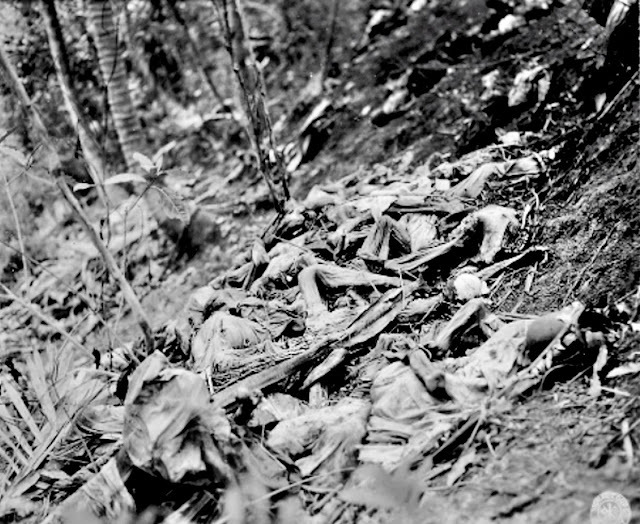 The picture was included as an attachment to the investigative report on the Japanese war crimes in Lipa. After the United States Army had successfully freed Batangas Province from Japanese control sometime in May of 1945, its War Crimes Branch immediately set about the task of investigating alleged war crimes committed by the defeated Japanese and prosecuting those responsible for these. By October of the same year, investigators from the Judge Advocate Section1 of the United States Army, Captain Herbert C. Likins and 2nd Lieutenant Neil Oliver, submitted their findings to the Prosecution Section about the massacre of civilians in the then-municipality of Lipa2. ○ “One woman was bayoneted to death because she refused to submit to the (sexual) advances of a Japanese officer. ○ “Two groups of civilians of two hundred and three hundred, respectively, were pushed into wells where they perished either by drowning, being crushed by heavy objects dumped upon them or by gunfire. ○ “Another group of over five hundred civilians was led to a brook where the entire number was bayoneted, practically all of them dying. ○ “The other group, composed of some six hundred civilians, was assembled by the Japanese at the Lipa Cathedral and bayoneted to death. ○ “Other murders and bayoneting of a smaller group took place at or about the same time. ○ “The evidence is sufficient to establish the crime of murder of at least twenty-two hundred and ninety-eight non-combatant civilian victims and the attempted murder of eleven others. It is fascinating that the investigators included in their report brief profiles of the “perpetrators” and this, in turn, allows us to visualize as individual persons some of those who were otherwise depicted as monsters in our province’s history and folklore. Original caption: Photograph of the scene where victims were bayoneted. The picture was included as an attachment to the investigative report on the Japanese war crimes in Lipa. ○ General Masatoshi Fujishige, described as 5’ 2” tall, very effeminate and in charge of the Japanese garrison stationed at Mt. Marifuyo. ○ Major Tanabe, described as 5’ 8”, wore glasses and a Hitler-type mustache. He spoke little English and no Tagalog and in charge of the North Garrison in Lipa from 1943 to 1945. ○ Captain Cuna, described as 5’ 2” and well-built. He was about 32 years old, wore glasses and smoked either a pipe or cigarettes. He had a small scar on his right cheek, spoke in a loud voice and stood with a straight posture. He was said to have been stationed in Lipa for a long time. ○ Captain Isao Ichimura, described as 5’ 1”, about 24 years old, was very bow-legged and acted as an interpreter. He spoke Tagalog well, was very fond of women and smoked incessantly. He was said to have been connected with the Military Police. ○ Sergeant-Major Masao Aoki, described as 5’ 11” and about 26 years old. He walked with his head bowed and his shoulders swayed exaggeratedly. He smoked heavily and was fond of music. He spoke Tagalog well along with some English and frequently wore civilian clothes. ○ Sergeant Torakichi Yagi, described as 5’ 4”, about 34 years old and of husky built, very dark complexioned (and probably especially so for a Japanese), was very quiet and spoke softly and knew very little Tagalog. ○ Hatogai (first name handwritten and unintelligible), described 5’ 4” and of dark complexion, wore his head shaven and had a short mustache. A chief of the Kenpetai (the Kenpetai was the military police of the Japanese Imperial Army6), he was well-educated and could speak German but not Tagalog or English. He was also known to be very fond of western music. The investigators concluded their report by making this recommendation: that Aoki, Cuna, Fujishige, Hatogai, Ichimura, Tanabe and Yagi along with other perpetrators of the atrocities committed in Lipa be tried for murder if and when apprehended. Cuna and Tanabe were still at large while everyone else included in the report was already under American custody at a prisoner-of-war camp. Fujishige would subsequently be convicted and hanged for the crimes of which he was accused, but the fate of the others named in the report was outside its scope and cannot be included in this article. 1 The Judge Advocate office’s primary concern is military justice and military law. “Judge Advocate General’s Corps,” Wikipedia. 2 “Report Number 84, War Crimes Branch, Judge Advocate Section General Headquarters, AFPAC of Investigation of the Massacre of Approximately Twenty-two Hundred and Ninety-Eight Filipino Civilians and Looting and Destruction of Lipa, Batangas, P.I. in February 1945,” online at the Bataan Legacy Historical Society. 3 “Historical Data” were a collection of documents researched and written by Department of Education teachers in the early fifties to recreate local histories destroyed during World War II. Online at the National Library of the Philippines Digital Collections. 4 The use of “city” in reference to Lipa in 1945 was, of course, erroneous. Lipa did not become a city until 1947. “Lipa, Batangas,” Wikipedia. 5 “Filipino survivor of wartime massacre expresses mixed feelings about Japanese emperor’s visit,” online at Asahi.com.